With many companies advertising party bus limos in Waterloo and the surrounding areas, it can be hard for someone looking to find the right limo company to choose a limo for their special occasion. That is why, when you are planning an event in Waterloo, and are in need of a party bus limo, the first choice you should consider is Platinum Party Bus Limos in Waterloo. 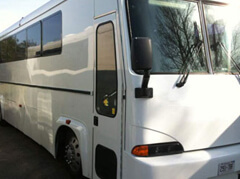 We offer you with a variety of party bus limo fleet, such as vehicles that seat 18 passengers to 26 passengers. Each one having its own colour and style, perfect for the occasion that you are looking to reserve a party bus limo for. Other limousines include larger limo buses that can seat 30 passengers to 50 passengers. These limo buses offer the most in luxury and style, great for such occasions as a wedding limo in Waterloo, a prom limousine service, night out limousine services and more. Night out limo services in Waterloo include birthday party limos, concert event limo rentals, bachelor party limo and more. We even specialize in corporate limo events, and airport limousine services. When you are ready to book a party bus limo with Platinum Party Bus Limos, contact us and one of our representatives will be able to assist you today.